Booby and the Beast: What Can We Do Now? Well, that didn't go as I had hoped. I am still troubled by Republican plans to gut the Affordable Care Act, phase out Medicare, and -- in all likelihood -- reduce spending on cancer research. But those are not my only concerns, not by a long shot. Maybe I should give you some background on me. I think I mentioned way back at the beginning of this blog that I grew up an Army brat. I can't find the reference, but trust me on this. It happened. My family moved, on average, every two years. I went to three different high schools, two of which were majority minority. Having lived on military bases -- which were very racially diverse, maybe still are -- until late in middle school, I didn't think much of it. I took that diversity for granted. 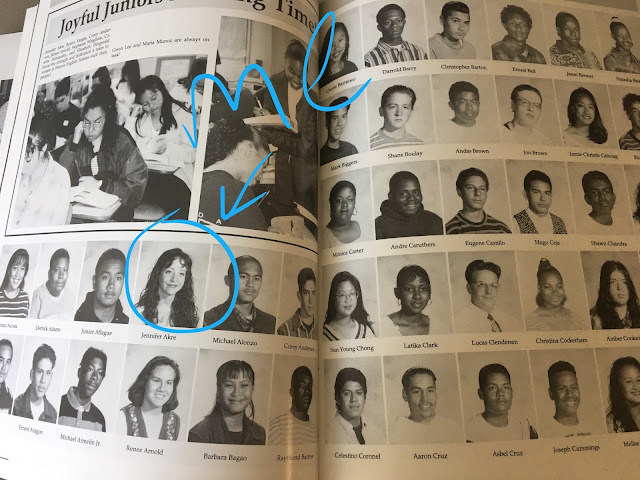 Here's a page from my yearbook in 1995, the second high school I attended. Don't ask me what I was thinking with that hair. But you see the faces of my classmates? This is the bubble I grew up in. We also had the benefit of not much socioeconomic adversity, since most of our parents were in the military. Growing up, I took acceptance of our differences for granted. For years, I naively assumed that racism was pretty much gone in this country because I didn't see much of it in my early life. I lived in Korea and Alabama twice and Florida -- and because us kids were mostly getting along (except for that tiff between the Puerto Rican students and Mexican students at my high school in Orlando that one time), I wrongly assumed adults were mostly okay with each other, too. Even as I witnessed with horror the killing of Trayvon Martin, Terence Crutcher, and SO MANY others, it didn't dawn on me that racism was still prevalent enough in this country to elect Donald Trump. I still held out hope that we would collectively stand up against an openly racist and inflammatory candidate. I'm not sure that military diversity bubble was the most productive for my worldview, since it meant that I was surprised and gutted by this year's election. I am heartened only by the fact that more of the electorate voted for kindness and inclusion, but that doesn't change the outcome. I still don't understand or begin to make excuses for the 53% of white women who voted for Trump. If you are one of them, can you please explain your decision to me in a way that doesn't belittle Hillary? I can wholly understand how reasonable people could not like Hillary's policies, but to choose a man who would "grab 'em by the pu**y" to represent women's interests? Our daughters'? Did you hate Hillary that much? Can you not see past the end of your noses? Are you -- my neighbors -- really supremacists? I'm trying to understand, and I just don't. "I'm not giving up, and neither should you." And A Tribe Called Quest has always been one of my favorites. 3. 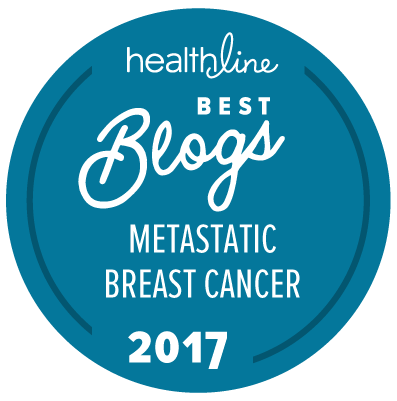 MetaVivor.org, which is committed to funding metastatic cancer research. 4. HealinComfort by Cherie Mathews: similar to the Brobe, above, but meant to be worn out of the house, too. I think I used safety pins to keep my drainage bags hooked to the inside of my zip-up sweatshirt. But I had Chris to help me with fastenings, and this shirt would have been so much easier. 5. Tigerlily Foundation: helping young and underserved women get through cancer. 6. Shay Sharpe's Pink Wishes: granting wishes to terminal breast cancer patients. 7. PAL Experiences: opening up new worlds for children living with autism. 8. Kerry Burki: a catalyst for positive change in our world. 9. Lara Agnew: my talented friend who reveals the beauty in our world. 11. AnaOno Intimates: beautiful lingerie by and for breast cancer survivors. 12. HulaBelle Swimwear: bathing suits for women who've had breast cancer. 13. Cat & Owl Co.: fun games to play with your young children that also teach them math concepts. Quinn LOVES these games. 14. Brim Papery: cards, mugs, and paper products that make great gifts. 15. Emily McDowell Studio: best known in my circles for the "Please let me be the first to punch the next person who tells you everything happens for a reason" card. Also, here is a list of organizations that need our help right now. This week, my family and I have also donated to Planned Parenthood, contributed to the ACLU, and I'm going to find ways to give back to my community, here in still red Arizona, that don't simply involve writing a check or canvassing in neighborhoods that apparently turned out to vote for Hillary in much larger numbers than my own. What will you do? An existential crisis is taking place among half the American population. It seems like the belief about our core systems and values rested on shallow grounds. Who are these strangers among us?